Yes its 46 feet Long. HUGE FUN for all ages. Race, Run, Hop, Crawl, Push, Climb, Slide, and much much more. 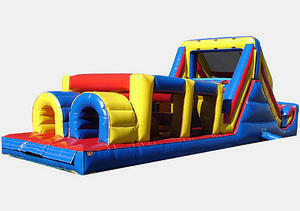 New to Bouncey House Rentals inventory is the exciting 46 Obstacle Course. This ride is fitted with traditional inflatable obstacle course features for every kid and adult to plow through. Participants can jump, push, crawl, climb and slide their way through as they race to the finish. The 50 Obstacle Course boasts an 11-foot tall slide platform that will have any rider racing with excitement. It even makes for a great form of exercise that is safe for all. Bouncey House Rentals makes sure to have the manufacturer build all its rides according to industry standards for safety and quality. The 50 Obstacle Course is approved by New Jersey and Pennsylvania guidelines for inflatable amusements. Do not settle for less when Bouncey House Rentals takes extra care to give you the best inflatable games.